In the year 2199, Earth is all but destroyed and human life is at risk of dying out. The last hope of the planet lies with Captain Okita and his plucky crew, who, after receiving a strange message from a woman named Starsha on a different planet, refurbish the derelict spaceship Yamato and set out to retrieve the Cosmo Cleanser. Haunted by the loss of his older brother Mamoru, Susumu Kodai is at first reluctant to trust Captain Okita, but before long, he and the rest of the Yamato's crew have sworn loyalty to their captain, their mission, and their ship as they set sail in the sea of stars that is space. Three years before Captain Harlock set sail, manga master Leiji Matsumoto chronicled the adventures of a different space-faring band, the crew of the Yamato. Drawing from Japan's military history, the story is clearly earlier and less well-developed than the tales of Matsumoto's space pirates and trains, but if you've ever watched or read a science fiction anime or manga dating past 1974, you've doubtless seen its influence. That makes Seven Seas ' release of the entire series in one hardcover omnibus exciting, whether you're a fan of the genre, of classic manga, or of Matsumoto's works in general. As you might guess from the title, the story is directly influenced by a variety of Japanese military actions. The most obvious is in the name of the ship itself – the original Yamato was a WWII battleship, sunk by American forces in 1945 and whose wreckage was not discovered until 1982, eight years after the manga was published. That means that Matsumoto is largely drawing on the myth of the ship rather than the history of its discovery and the romance of the idea that one of the greatest vessels in the Japanese Navy might sail again. In fact, when the crew, under Captain Okita, go to reclaim the ship in the story, they find her resting on the bottom of the sea, looking for all the world like a sunken relic, and she retains the look of a seagoing vessel even when she takes to the stars, a motif Matsumoto would continue to use in his chronicles of Captain Harlock . Many of the characters within the series are also named after various figures in Japan's military past – Captains Okita, Hijikata, and Saito are all named for captains in the 19th century military group the Shinsengumi, while Tokugawa and Sanada both draw from earlier conflicts, although there were Tokugawa shoguns up through the days of the Shinsengumi. While this is a little bit of a heavy hand from Matsumoto, whose later space operas take on more of a poetic style, it works with the theme of the Yamato as the last best hope by drawing on the mythologization of these historical figures rather than on their actual exploits. It also makes the story more accessible to those who aren't familiar with the references (or just don't care about them), keeping them more as Easter eggs for readers than important knowledge, although at least one even won't come as a surprise if you know your history. The main character of the story is nominally Susumu Kodai, a young student conscripted into Okita's crew when he and his friend and fellow student Daisuke intercept the dying message of a woman from a far-off planet. Susumu's brother has recently died in a suicide mission (for which he defied Okita's orders), and Susumu blames the captain for his brother's death. He soon realizes that holding the grudge is largely pointless, although he continues to mourn his brother, as the Yamato's mission becomes ever-more important. By the time the first of the three volumes in the omnibus ends, he has come to see the ship as his future, despite the fact that with the success of their mission the Earth government regards the vessel as disposable. There is a sense that this is Matsumoto's commentary on the fate of the original battleship, or perhaps on how the government treats old soldiers, as the Yamato and her crew are largely devalued once they're done saving the world. This is what sparks the action in the third volume, with the second largely devoted to Susumu feeling lost in a system that doesn't seem to really care about the fact that they only still exist because of the action of Okita's crew. The story then simply cuts off as Susumu and the rest of the crew are on the trail of the next great threat to Earth's continued existence, finishing as they set off with he words “Never the End” at the bottom of the page and a major cliffhanger at the top of it. This is definitely disappointing, especially since with the final book in the omnibus Matsumoto is beginning to truly develop the style of science fiction art that still makes his works breathtaking. It is therefore in the final third of the omnibus that you'll find the most typical Matsumoto storytelling, although the work is still less polished overall than Galaxy Express 999 or Captain Harlock . The biggest issue is the way that time skips around a lot, with one attempt at storytelling in flashback not quite working and no reason given for the sole female main character acting as she did. But the scenes of space battles or just a vessel alone in the vastness of space finally achieve the sense of grandeur that characterizes Matsumoto's space operas and the narration begins to take on the sweeping emotional tone that is typical of his works. Characters, while still using Matsumoto's four or five basic designs, remain consistent throughout the omnibus, as do the impressive technological set-ups, which capture the mid-twentieth century's image of computers and cockpits as rife with dials, buttons, and levers in minute detail. 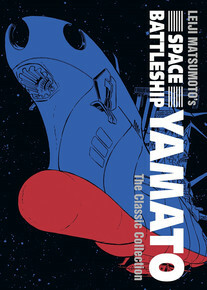 Space Battleship Yamato is probably going to be more enjoyable for those already familiar with the anime (known originally as Star Blazers in the US) or fans of Matsumoto's works. It isn't quite as strong as some of the later series that have been brought over, and if you don't like your sci fi old school, it may feel a little dull. But for readers of classic manga, science fiction, or Matsumoto in general, this is a treat that just keeps getting better as it goes on, even if it does come to an all-too-abrupt stop.